MM's Kitchen Bites: Green Beans Thoran/ Green Beans Stir Fried With Coconut...Kerala, take 2, action!! Green Beans Thoran/ Green Beans Stir Fried With Coconut...Kerala, take 2, action!! Heat oil in a pan and add urad dal followed by mustard seeds. When the dal gets light brown and mustard seeds start popping add onions and green chillies. Stir well. When the onions go soft (don’t let them turn brown) , add the beans, salt and turmeric. Cook covered on low flame till the beans are cooked – you can sprinkle a little water, if required. Do not cover the beans completely or overcook as the beans will lose colour and texture. 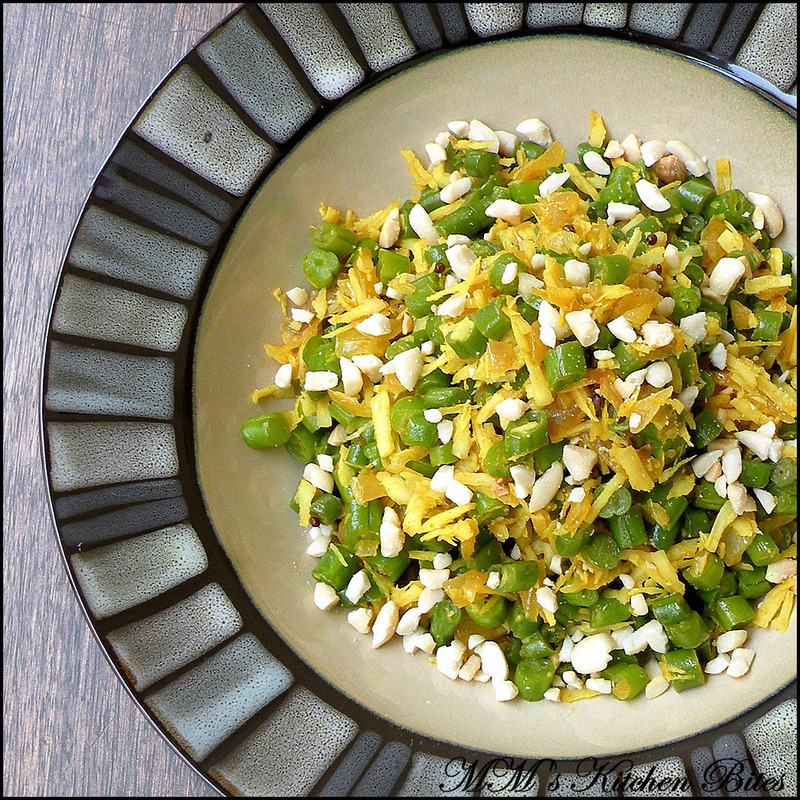 Add in the grated coconut – mix well and cook for another couple of minutes. Transfer to a serving dish and sprinkle with crushed roasted peanuts. Serve with rice or roti. You are supposed to use shallots, I didn’t have any so used regular onion. You can coarsely grind the shallots/onions with coconut and green chillies and can either fry this paste first before adding the beans.